Sarasota Bay Watch’s annual fundraiser is getting a new tagline – “Scallopalooza, It’s Clamtastic!” Save The Date: September 24th at the Sarasota Yacht Club. The new slogan let’s people know that our community-driven scallop program is expanding to include southern hardshell clam restoration. Hardshell clams are an important part of our bay’s ecosystem and they have great economic value. Adult clams have very few natural predators, they are more resistant to red tide than other shellfish, and a hardshell clam can live for 30 years or longer! We have a fleet of dedicated volunteers and their boats. We have loads of scallop restoration experience. We have scientific partners and expert advisors. And we have storage lockers full of buckets, bubblers, tools and equipment. We are ready to go! All that is missing is funding to raise baby clams. Our friends at START have stepped up to get the ball rolling with an initial donation of $3000 in seed money to kickstart this program – Thanks So Much! We need another $7000 to make this happen. So come to “Scallopalooza, It’s Clamtastic” on September 24th and help us meet this challenge. Meanwhile, our scallop restoration program is still going strong. We, and our partner Mote, previously collected over 1000 juvenile scallops, and they have been growing nicely in the Community Scallop Nursery on Mote’s campus. These scallops have developed into maturing adults that are getting ready to reproduce. So it’s time to get them out of the nursery and into the bay in protective cages to promote natural spawning. 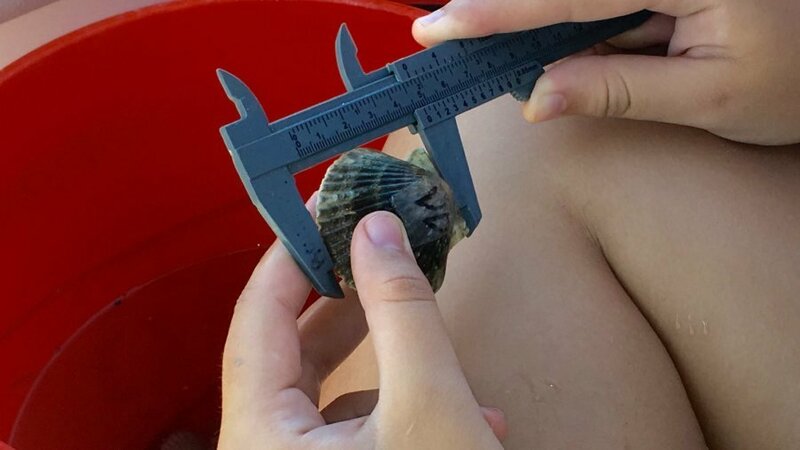 Sarasota County has taken some of these scallops to put in their own cages, while Mote interns and SBW volunteers are monitoring clusters of scallops placed in the southern and northern regions of Sarasota Bay. The scallops in cages have been doing great; growing quickly with almost a 100% survival rate. Additionally, soon we will collect a new batch of adult brood stock from northern Florida gulf coast waters, which we will use to start the next cycle of scallop restoration. Also come out for the Annual Sarasota Great Scallop Search on August 13th at the Sarasota Sailing Squadron. Bring your friends, boat, sunscreen and snorkeling gear! It’s a fun morning for the entire family, and it helps us get a snapshot of scallop populations across the bay. For more info about Sarasota Bay Watch and upcoming events visit www.sarasotabaywatch.org and follow us on Facebook to see pictures and videos of our community in action protecting and restoring the bay.